That was the thought that Anna, Everett, Grace and I had as we headed out from our little Hendrix bubble to “America’s First Resort” Hot Springs, Arkansas to attend the 20th Grassroots Radio Conference (which was being sponsored by KUHS, the Hot Springs community radio station). Having never gone to any sort of organized radio conference before, none of us were quite sure what to expect. 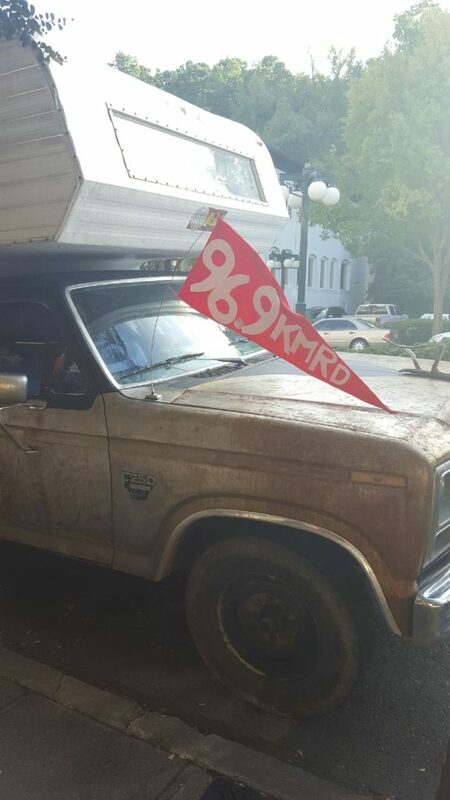 However, once we arrived at The Springs Hotel and Spa on that beautiful Saturday morning, we definitely found ourselves in a like-minded community of people who were passionate about community and college radio from all over the United States, from Tucson to D.C. and Ames to New Orleans. The seminars were very informative and taught by experienced veterans of the trade. We were all able to split up and cover all sorts of topics ranging from antenna maintenance, to music licensing, to the plethora of software and hardware out there for every aspect of terrestrial and online radio broadcasting. The networking opportunities were valuable and numerous. We sat and talked to people who ran radio stations from as close as Fayetteville (KPSQ) and Bentonville (KOBV) or as far away as Madrid, New Mexico (KMRD) or the University of Washington at Bothell (UWave Radio). And just look at this cool van that KMRD came in! Of course, we also had time for fun as well. We explored the downtown Hot Springs area, and saw people that were also there for the Hot Springs Documentary Film Festival that was happening at the same time. We stopped in many of the downtown shops, ranging from coffee shops to toy stores to a shop dedicated to Star Wars memorabilia. And as for me, I may or may not have gotten more candy and cupcakes than I could eat, or indeed more than what is healthy for someone such as myself (shoutouts to the Colonial Candy Corner and Fat Bottomed Girls Cupcake Shoppe). In the end, we truly enjoyed every minute of the conference, from the seminars to the people. And when the next one happens, wherever it may be, you can be sure that we’ll do our best to be there too, to be with those who are proof that community and college radio in America is alive and well.